According to Danish and Australian researchers who used an improved version of a 250-year old theory (The Titius-Bode law), there are billions of the stars in the Milky Way located in the “habitable zone”, where liquid water might exist, and with it, life as we know it. For a planet to have liquid water — something necessary to support life as we know it — it has to be within a certain distance of its star. Too close, and the water burns up. Too far away, and it’s a frozen wasteland. By using the Kepler telescope, astronomers have discovered over a thousand exoplanets in our galaxy. Most of the planetary systems discovered have 2-6 planets, but because Kepler is only suitable for discovering planets near their star, many others might lie undiscovered. When you’re working on scales this big, it mostly becomes a matter of statistics, so researchers from the Australian National University and the Niels Bohr Institute in Copenhagen wanted to calculate the probability for the number of stars in the Milky Way that might have planets in the habitable zone, using what Kepler found as a sample size. The calculations show that billions of the stars in the Milky Way will have one to three planets in the habitable zone, where there is the potential for liquid water and where life could exist. Steffen Kjær Jacobsen explained: “We decided to use Titius-Bode law to calculate the potential planetary positions in 151 planetary systems, where the Kepler satellite had found between three and six planets. In 124 of the planetary systems, the Titius-Bode law fit with the position of the planets. They predicted there were 228 planets in the 151 systems by inserting the probable location of planets into the pattern among those whose sequence can already be observed. They also added an extra planet beyond the outermost in the sequence. Researchers evaluated the number of planets in the habitable zone based on the extra planets and according to the Titius-Bode law for the 151 planetary systems. 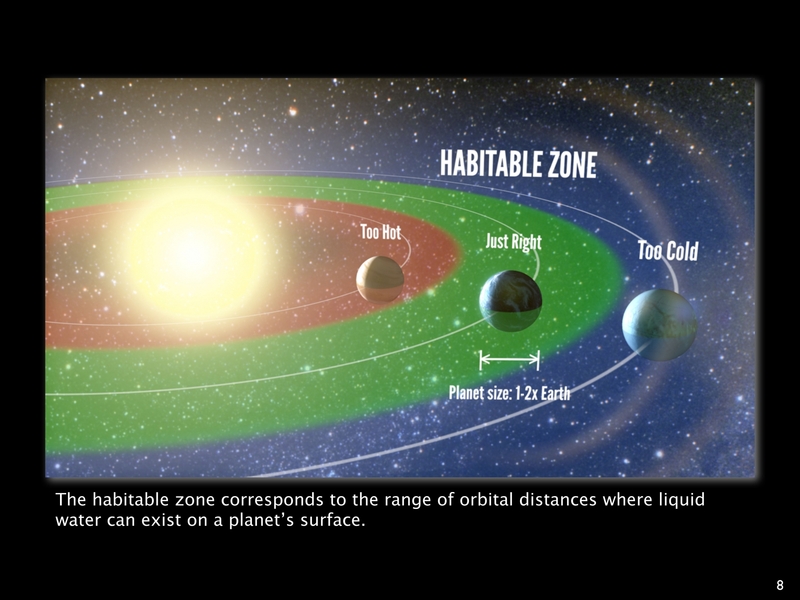 They found there were one to three planets in the habitable zone of each planetary system. “According to the statistics and the indications we have, a good share of the planets in the habitable zone will be solid planets where there might be liquid water and where life could exist,” said Jacobsen. To help confirm their theory, they’ve flagged a number of supposed Goldilocks planets that Kepler should be able to see at some point. They hope that other scientists will spot them, adding weight to the “missing planets” they’ve calculated. Unfortunately, being in the habitable zone doesn’t mean that liquid water is present — and the presence of liquid water doesn’t necessarily mean that life ever can, will, or did exist. But here’s to hoping. Bottom line: Using NASA’s Kepler satellite, astronomers have found about 1,000 planets around stars in the Milky Way and they have also found about 3,000 other potential planets. Many of the stars have planetary systems with two-to-six planets, but the stars could very well have more planets than those observable with the Kepler satellite, which is best suited for finding large planets that orbit relatively close to their stars.